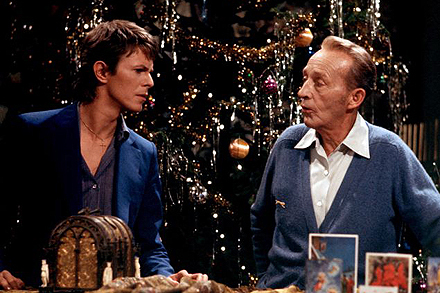 One of the strangest yet most successful Christmas duets ever has to be The Little Drummer Boy/Peace On Earth by Bing Crosby and David Bowie. Interestingly enough, it almost didn’t happen. Crosby was in England on tour in September of 1977 when he was asked to host the Merrie Olde Christmas Special. Bowie, who was 30 at the time, was asked to sing a duet with Crosby, then 73. When Bowie learned was told that he was to sing The Little Drummer Boy, he refused, saying that he hated the song. A few hours before filming, a team of composers spent 75 minutes creating a new melody for Bowie to be sung as a counterpoint to Crosby’s pah-rumpa-pum-pums. Bowie liked the new version and agreed to sing. After less than an hour’s rehearsal, the unlikely duet nailed the performance. The rest is Christmas radio history. Unfortunately, Bing Crosby died from a heart attack a month after the recording. The special was aired a month after his death.